When Oregon learned of its potential bowl opponents, there were several interesting candidates. Iowa, Northwestern and Wisconsin each would have been fine choices. But there’s no question that the Redbox Bowl committee struck gold when they matched the high-flying Ducks with their familiar cross-country foe, Michigan State, for their third meeting in five years. The rubber match won’t be for a spot in the playoff like their first two matchups were, but there’s still plenty of intrigue. The offensive-minded Ducks finally look to be hitting their stride, but they’ll get perhaps their biggest test of the season facing Mark Dantonio’s defensive juggernaut. If the past two games between these teams are any indication, this has the potential to be a riveting 60-minute fight, full of plot twists, memorable moments and career-defining performances. So sit tight, grab a drink and get ready for a New Year’s Eve treat. The Ducks’ offense is still a force to be reckoned with. 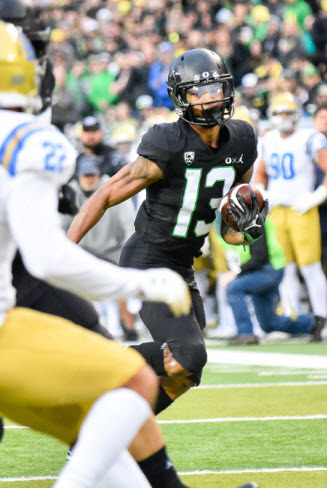 The number-one storyline in the Redbox Bowl is an all-too-common one that captivates fans every time: a high-scoring, fast-paced offensive machine meets a physical, suffocating defense that makes up for its lack of fanfare by smothering opposing offenses. For all the talk of the Ducks’ offensive demise, they still possess firepower that few in the country can match. The Ducks “merely” average 37 points per game — a number that ranks 17th in the country. Furthermore, while their 445 yards per game rank just outside the top 25, they are 23rd in Offensive S&P+ (an opponent-adjusted metric that discounts garbage-time statistics). No, the Ducks’ offense isn’t as lethal as it has been in years past, but it’s still dangerous enough to blow past most defenses. Unfortunately, the Spartans’ defense may not be one of them. As good as the Ducks’ offense has been, the Spartans’ defense has been even better. Surrendering just 311 yards and 18 points per game, both of which rank in the top 15 nationwide, the Spartans feast on opposing offenses and render even the best schemes ineffective. So, which one wins out in the end? The Spartans’ defense has been dominant. We’ve seen cases where elite defenses have struggled to contain an offense that is firing on all cylinders. Clemson made easy work of Alabama’s vaunted defense in their past two national championship games. And in last year’s Rose Bowl, Oklahoma silenced the critics who claimed that their prolific offense wouldn’t be successful against a “real” SEC defense. But the opposite has been true, as well. In 2015, Michigan State shut down the ultra-talented Ohio State offense in a stunning defensive struggle. Then, in the 2016 Citrus Bowl, Heisman winner Lamar Jackson and company couldn’t do anything against an athletic LSU defense, as Louisville scored a paltry nine points. Even in this recent series between the Ducks and Spartans, both the Ducks’ offense and the Spartans’ defense have had their days in the sun. Just when it looked as though the Ducks had provided the formula for dissecting the Spartans’ aggressive defense with a resounding victory in 2014, the Spartans responded by grounding the Ducks’ distinguished offense the following year in a game that went down to the wire. Three years later, it feels like the score is unsettled. So, what better way to end the year than by re-igniting the age-old offense vs. defense debate with two inter-conference rivals that have given proponents of both schools of thought plenty of ammunition? What makes this contest even more compelling is the chess match that will ensue when the Ducks’ ballyhooed quarterback faces one of the most feared pass rushers in college football. Herbert is out to get his first bowl win. 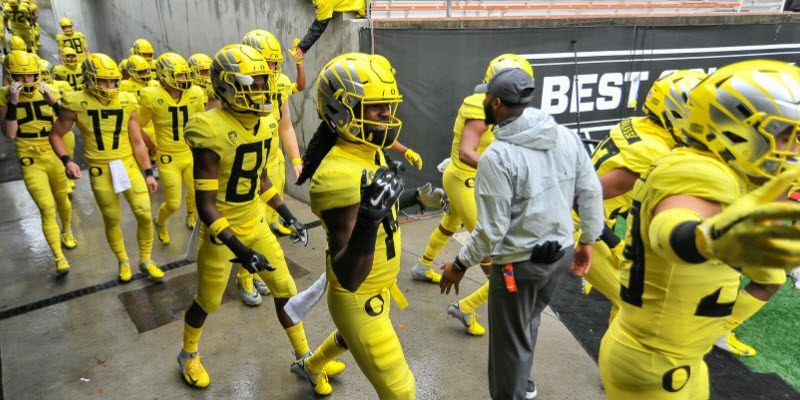 Christmas came early for Ducks’ fans when Mario Cristobal confirmed that Justin Herbert will be ready to go come gameday. Herbert is perhaps the biggest star of all in the matchup, and many are anxious to see how he responds following his disappointing effort in last year’s Las Vegas Bowl. He is coming off of another solid season, and his presence will be instrumental if the Ducks hope to overcome a ferocious Spartans’ defense. But the Spartans have a star of their own, and he’ll be motivated to prove he’s more than capable of hanging with the Ducks’ renowned signal caller. The Spartans’ biggest headliner, defensive end Kenny Willekes, is an absolute terror, one of the most dominant forces in the entire country. His 8.5 sacks are tops on the team, as are his ridiculous 20.5 tackles for loss. And as great as those numbers are, they don’t even account for all of the other pressures he has generated throughout his marvelous 2018 campaign, which have made life difficult for many opposing quarterbacks. Willekes can terrorize even the best offensive lines with his tremendous blend of technical proficiency and whistle-to-whistle effort. He is the best of a defense full of talented players, and when he lines up opposite Herbert on gameday, fans across the country will want to tune in to watch them duke it out. The stage is set for yet another captivating game between these two programs, whose teams have shared strikingly similar paths. Both nearly claimed the ultimate prize at the height of their powers earlier in the decade, and both have since suffered an unceremonious fall from grace. In a year where both teams were expected to be dark-horse conference-title contenders, many fans in each camp are disappointed with the way their respective seasons have gone this year. Each team has suffered a handful of head-scratching losses that quickly derailed those championship aspirations. But a win in a game like this is often enough to erase the sting of such defeats. There’s no better way to gain momentum heading into the off-season than by getting a statement victory in a bowl game and riding that post-game high all the way into the new year. It’s tough to say which team will be able to get that statement win come New Year’s Eve, but one thing’s for sure: with such evenly matched teams fighting to regain national relevance, it will once again be an entertaining battle.